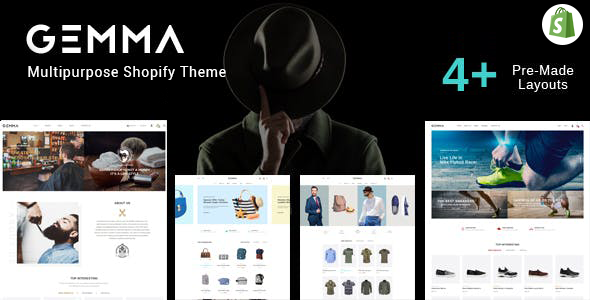 Gemma – Multipurpose Shopify Theme is an outstanding eCommerce website theme, developed on Shopify platform. You can sell Men & Women Fashion, Cosmetics, Shaving Kit, Ready Made Clothes, Hair Care, Bags and almost all other products that you can imagine. Gemma is absolutely an efficient tool to build up a website that brings substantial revenue. This quick install theme has a lot to give you. It comes with Shopify Builder, Multiple Theme Colors, Box Layout, Newsletter Popup, Notification Bar, Ajax Wishlist & Popup and many more things for the visitors. We have tried to make our theme most user-friendly since you will build an eCommerce site with this it. In addition, Gemma has a smart Mega Menu, Responsive Layout, Cross-Browser Compatibility, 20+ Sections, Slider, 2 Footer Styles and many more attributes to build up a rich website. On the other hand, people’s engagement is the most valuable thing of a website. We cared about this issue since we research the industry and anticipate the real time usage of the theme. Therefore, Discuss Comment, Product Share, Post Comment, SEO Optimization and Contact Map are there to catch the visitors. Furthermore, we have ensured your comfort by providing a detailed documentation, easy installation and our assistance is to be continued through further updates for free and dedicated support. Install Gemma – Multipurpose Shopify Theme as early as you can.